Times are according to public transport timetables. Berlin Tourist Information Centres are open 7 days a week with extended hours from April to October. We are comparing Berlin WelcomeCard: Transport, Discounts Card Prices from leading ticket suppliers and Try to find you Cheap tickets prices on the market. Pick up your Berlin Welcome Card from Tegel or Schonefeld Airport, or from one of Berlins Tourist Information Centres and discover this modern city at your own pace. With unlimited access to all of Berlins public transport within the AB Zones or ABC Zone (if selected) for your preferred number of days. You'll be able to make your own custom itinerary to suit your travel needs. The Berlin Welcome Card offers visitors a convenient and affordable pass which makes traveling around the city simple and stress free, no need to carry multiple tickets or queue at self-service machines because the same ticket is valid for all modes of transport for all days. The Berlin Welcome Card also comes with a complimentary guide book with recommendations of how to spend your time and a city map so you won't get lost. Use your key to the city to travel to the city's most famous sites including the Berlin Wall Memorial, Checkpoint Charlie, the German Government and Brandenburg Gate. The best feature of the Berlin Welcome Card is the discount and offers booklet which comes with it. With access to discounts on over 200 of Berlin's attractions, there's certain to be something for each and every visitor. Offers include up to 50% discounts on city attractions, theatre tickets, famous landmarks, shopping, spa's, walking and biking tours, select restaurants and boat rides. Ideal for budget/independent travellers and for families with young children to travel around Berlins Central Zones and visit a variety of discounted attractions. Your Experience With Berlin WelcomeCard: Transport, Discounts Card? Enjoy unlimited use of Berlin public transport in AB or ABC Zones. Personalise your experience with a 2, 3, 4, 5, 0r 6-day pass. Save money with 25% to 50% discounts and offers for over 200 locations in Berlin, including top attractions, museums, tours and eateries. Travel like a local with a free city map and guidebook. What Berlin WelcomeCard: Transport, Discounts Card Includes? Handy pocket guide in German and English with free city map. Unlimited use of Berlin's public transport in Zones ABC or AB. Ticket valid for 1, 2, 3, 4, 5, or 6 Days. Discounts on many of Berlin's sights and attractions. Discounts include: Boat, bike and walking tours – popular museums – theatre tickets – attraction entrances – spas – shops – restaurants. Unbiased comparison of Berlin's Best City Passes /Discounts Cards( Berlin Welcome Card vs Berlin Pass vs Berlin Museum Pass vs Get2Card) based extensive research, Tripindicator team came up with comprehensive recommendations for Family, Couples and Single travelers which helps you choosing Best Berlin City Pass suitable for your travel. Unbiased comparison of Berlin's Best Hop-on Hop-off Sightseeing Tours operators(Berlin City Sightseeing tour, City Circle Sightseeing Yellow Bus and Tempelhofer Hop On Hop Off Bus Tours) based extensive research, Tripindicator team came up with comprehensive recommendations for Family, Couples and Single travelers which helps you choosing Best Berlin Hop-on Hop-off Sightseeing Tour suitable for your travel. If you are staying outside of the city centre or arriving by plane then we recommend selecting the ABC zones version of this card. 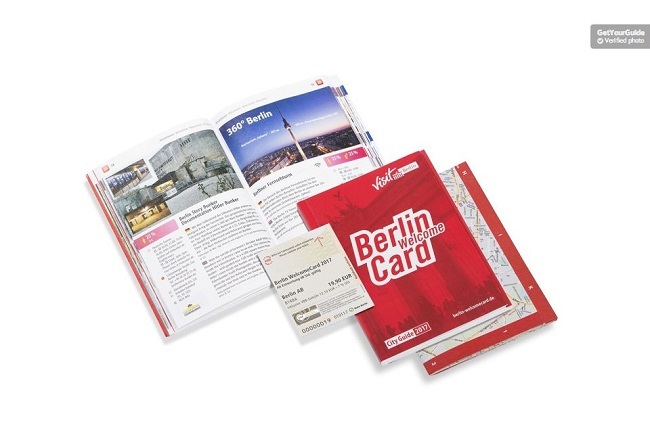 Travelers Reviews about Berlin WelcomeCard: Transport, Discounts Card? This travel pass has been reviewed over 3,000 times on Get Your Guide and has a, honourable 4.6-star rating. Viator users have given the Berlin Welcome Card 5 out of 5. Travellers say that this pass is great value even if you don't take advantage of the venue discounts. Comments agree that the card is very easy to use and will save you both time and money on your vacation. Berlin city buses and trams are wheelchair accessible, Berlin S-Bahn and U-Bahn have disabled access at most stations. Your voucher must be printed on A4 paper. Your Berlin Welcome Card can be collected from one of the Berlin Tourist Information Centre's. On ticket is valid for all modes of transport and for all days. The Berlin Welcome Card is active from its first use, you must scan your ticket each time you board public transport and each time the ticket is used for offers on sights/attractions. Berlin Welcome pass can be used only zones A and B unless you have selected Zone C also. Tegel Airport is located in Zone A, Brandenburg and Schonefeld Airport are located in Zone C.
Up to 3 children (aged 6-14) and one adult can travel on the AB or ABC Welcome Card. Children under 6 years are free. Tickets Collection: Any of the Berlin Tourist Information Centre's listed below. Schonefeld Airport, Terminal A (7.00-22.30). Tegel Airport, Terminal A, (8.00-21.00).